A fast growing mat forming ground cover with masses of flower in spring, Aubrieta deltoidea grows well as a cascading plant. Best planted where it can be allowed to tumble over a retains wall or garden edge it thrives in a humus rich well drained soil. In warmer climates it will thrive in morning sun and a little afternoon shade. Once established this is a remarkable tough little plant that will give reliable colour year after year. The name rock cress comes from its natural ability to grow in crevices on rock walls. This is a plant that naturally spread by rhizomes, it is easy to keep in check with a little pruning and removing any errant runners. After the first flush of flowers, get the hedge clippers out and deadhead, you will normally get a good second flowering. This also keeps the plant in a tidy clump. Top dress with some well rotted compost and a little lime over winter. If drainage is good and they are not subjected to very hot afternoon sun they can be long lived plants. This a plant that spreads by underground rhizomes, and this means that division is the easiest method of propagation. This can be done in late spring after flowering, or in winter. Propagation from seed is best carried out in early spring, surface sow with a very light covering as these seeds need light to germinate. Keep moist and seeds should germinate in around 14 days. Common Name – False Rock Cress. Soil – Well drained with some moisture. Tolerant of poor soils. Height – To around 10cms (3 inches). Spread – To around 40cm (16inches). 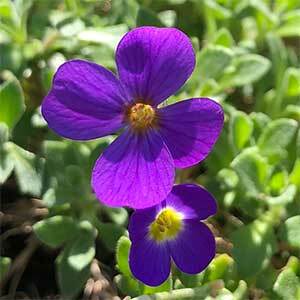 Flowers – Purple to Mauve with four petals. Foliage – Mid to deep green and triangular in shape.